During her third pregnancy, Jules made her health and the health of her baby a priority. Does your doctor deliver at Seton? Smiles Like These In As Few As Two Visits! Keep Your Curves, Lose the Bumps. See visible improvement in one treatment The Viora Reaction is the first -- and only -- FDA approved multi-channel, radiofrequency cellulite reduction treatment. Cellulite occurs in more than 80% of women over the age of 20. NEWUâ&#x20AC;&#x2122;s Viora Reaction is designed to treat those stubborn cellulite marks at the core, while strengthening existing collagen fibers. The result is a more toned, firmer appearance to your skin. If you have noticed that orange peel texture on your tummy, thighs, underarms and buttocks, youâ&#x20AC;&#x2122;re not alone -- and NEWU can help! New patients mention this ad to receive special savings. PLASTIC SURGERY Beauty you can see. Wellness you can feel. T R IBE Z A 64 On the cover: Dress by BCBG $345, Saks Fifth Avenue; Necklace $29, Beehive; Bag by Givenchy $1,280, By George; Shoes by Prada $720, Saks Fifth Avenue. clock wise from left: the bl ack swan theory, photogr aphy by davis ayer; michelle teague, photogr aphy by jay b sauceda; color me bad, photogr aphy by bode helm; home is where the art is, photogr aphy by casey dunn; fashionist-o, photogr aphy by paige new ton. Th i s y e a r ’ s Sp r i n g Fa s h i o n i s s u e is all about color (in case you missed the vibrant hues on the cover). We can’t seem to get enough of it — starting with the fashion shoot,“Color Me Bad,” beautifully captured by LA-based photographer Bode Helm at a stunning West Austin home. We continue to discover bright and imaginative colors in a tour of artist Elizabeth Chapin’s Travis Heights’ wonderland of a residence in the story, “Home Is Where the Art Is.” Everything about this season in style feels bold and exciting, and with the shifts in season comes new changes for us as well. It is with a heavy heart that we bid farewell to our designer, Avalon McKenzie (pictured), who is moving to Philadelphia for an incredible opportunity to work in graphic design at the Free We are so proud of our People headquarters. I can still remember the first time she walked in to our offices a little beautiful designer Avalon over a year ago for her interview. A Parsons grad, Avalon’s passion for design and sophisticated McKenzie and wish her the eye for style, paired with her warm and calming presence made her a standout for the job. We best in her new adventure in Philadelphia at Free People's immediately knew we had found someone special. I have loved watching her evolve and will corporate headquarters. greatly miss our sharing an office, where we often held brainstorming sessions about concepts for fashion shoots, upcoming editions of the magazine or new blogs I needed to read. We at TRIBEZA feel so lucky to have worked with such a poised, caring and free thinking woman like Avalon who is not only wise beyond her years, but also destined for many big things. Avalon taught me about what beauty there is in a quiet spirit — someone who thinks before she speaks, carefully listens and is comfortable in always being exactly who she is. She will forever be my favorite vegan. April also marks the last monthly Creatively Speaking column. Our deepest gratitude to Tim McClure for writing such thoughtful articles over the past six years — each one seemed to make us laugh or inspire us in a new and unexpected way. Illustrator Joy Gallagher truly brought each piece to life with her beautiful drawings, which she will continue to do with Kristin Armstrong’s monthly column. We hope to see you out at this month’s Austin FOOD & WINE Festival, as we get ready to celebrate all things Austin food in TRIBEZA’s May’s Cuisine issue! avalon mckenzie, photogr aph courtesy of joanna wilkinson of keep austin stylish. Copyright @ 2012 by TRIBEZA. All rights reserved. Reproduction, in whole or in part, without the express written permission of the publisher, is prohibited. 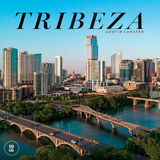 TRIBEZA is a proud member of the Austin Chamber of Commerce. mailing address 706a west 34th street austin, texas 78705 ph (512) 474 4711 fax (512) 474 4715 www.tribeza.com Founded in March 2001, TRIBEZA is Austin's leading locally owned arts and culture magazine. www.txsunandshade.com Showroom Hours: 10-5 M-F & 10-2 Sat. A selection of party pics from happenings in every corner of the city. KLRU celebrated half a century of inspiring creativity and learning in Central Texas at ACL Live at The Moody Theater. The evening featured a retro-inspired dinner and continued with performances by KLRU’s honorees, including Kathlene Ritch, Craig Hella Johnson, Charles Yang, Ruby Jane Smith and Asleep at the Wheel. Austinites toasted a beautifully redesigned Lexus of Austin dealership and the launch of the Lexus GS Sedan with champagne, an exquisite sushi bar and performances by noted musician Kat Edmonson. Also on display that evening was the highly anticipated LFA, Lexus’ Super Car, one of only 175 in the nation. Where can you pile on the charm? Dedicated to raising awareness about local conservation efforts, The Nature Conservancy of Texas invited keynote speaker Jeff Corwin to its annual luncheon and held a private reception for him the night before at the home of Deborah Green and Clayton Aynesworth. A lifelong environmental advocate and Emmy Award-winner, Corwin has hosted several Animal Planet shows and works to combat the world’s extinction crisis with his new “100 Heartbeats” project. Darden Smith and Kat Edmonson delivered stunning performances at FINO Restaurant Patio & Bar, benefitting the Be An Artist Program. The evening began with an exquisite three-course dinner prepared by Chef Jason Donoho. Founded by Smith in 2003, Be An Artist inspires creative pursuits among young students across the world. Austinites honored their peers at the Austin Under 40 Awards, recognizing distinguished young professionals. Held at the Austin Music Hall, the event included an awards presentation and silent auction benefiting the Young Women’s Alliance and Young Men’s Business League. The night wrapped up with a lively after-party at Rattle Inn. The Austin School for the Performing and Visual Arts presented The Art of Fashion at the Long Center, an evening of fashion, music and dance. Guests enjoyed a runway show and performances by the school’s talented students. Acclaimed singer-songwriter Patricia Vonne was a special guest at this year’s fashionable affair. The Art Allianceâ&#x20AC;&#x2122;s annual night of incredible art spaces, music and cuisine started off with a bang at the VIP and Media pre-party on Congress. The evening began with wines by TWIN Liquors and tasty bites by La Condesa, as guests explored a selection of stunning pieces from grayDUCK Gallery. The 2012 CASAblanca Gala at the Hyatt Regency recognized Gigi Edwards Bryant for her dedication to the rights of children in foster care. To celebrate, CASA of Travis County held a fabulous fĂŞte, complete with cuisine by Chef Javier Ortiz, casino games, a live auction and an after-dinner espresso bar. EnviroMedia Social Marketing celebrated “15 Years of Giving a Damn” with a party at its newly-expanded Sixth Street offices. The first marketing agency dedicated to the environment and public health, EnviroMedia invited its past and current clients, friends and staff to witness the debut of a new public service movement. Austin Ventures, along with HomeAway and Whale Shark Media, hosted the first annual “Hometown Hangover Cure” party at Rattle Inn. Guests enjoyed hearty food, top shelf liquor, tweeted hangover cures and tips and live music throughout the afternoon, including performances by Dale Earnhardt Jr Jr, The Lemurs and Wild Child. and boots). I donâ&#x20AC;&#x2122;t like gray skies, being cold, leaving a warm bed and bundling up to go run, pale legs, cold and f lu season (germs, donâ&#x20AC;&#x2122;t get me started) or chapped winter lips. When the first signs of spring emerge, I am more than ready to leave my wintery self behind. i l l u s t r at i o n b y j oy g a l l ag h e r For a limite d- e dit i on p r int , c onta c t jo ygall agh e r@g m ail .c om . I dearly love any chance I can get to reset and celebrate a fresh start. time to shift out of neutral and rev things up a bit. Plant some f lowers. This is different than calling Brad, my gardener, and asking him to plant some flowers. I mean dirt under my own (neutral polish colored) nails. Clean my windows — in my house and in my mind. The funk, paw prints and splatter are no way to welcome a new season. A good window cleaning, ideally after a gutter purge, is a symbol of clearer vision all around. Plan a trip — ideally to someplace warmer than here. This is motivation to reevaluate the workout plan, the wardrobe and the attitude. It’s good to have something to look forward to. Besides, like a fun happy hour or great previews at the movies, a little bit of advance sunshine kicks things off right. Maintenance. This is girl speak for bikini wax. When my girls at Tarrytown Nails no longer recognize me, this is a sign that it’s time. Either that or it’s time to listen to my younger friends and try laser. I’m still trying to deal with the notion of laser on my face. I can’t quite imagine it in a land down unda. Pony up and have my car detailed. I can only go for so long claiming, “Yeah, but it’s going to rain sometime…soon.” My vehicle smells like kid and dog park. Enough. Have a party. There is no better encouragement than to see my nest with fresh eyes. Dust off the cookbooks. Trade the red wine for bubbles. Spruce up the joint and fill it with my favorite people. I might even wear something bright. With lipstick. Spring it on. What is your favorite decade in fashion? The 1950s because it was a time when workwear became a part of everyday dressing — jeans, the Beat Generation and early rockers in Britain were the epitome of cool. The war was finally over, and clothing became extravagant again...no more wool and shoulder pads. Christian Dior designed “The New Look” with miles of fabric and cinched waists and glamour. Revlon introduced “Love That Red” lipstick. And smoking was great for you. If you weren’t in your current career, what would you try? A travel photographer or writer. What was your favorite article of clothing when you were a child? A strawberry knit cap and my cereal box sunglasses. I felt so glamorous! What piece of art would you most like to own? Van Gogh’s Starry Night. If you were an inventor, what would you invent? A time machine. There are moments I would love to experience again or to attend major events in history. Of course, I would never try to alter the course of history. That’s dangerous! When and where are you happiest? With historically low rates, flexible terms and professional expertise Call today to learn about our jumbo mortgages offering up to $10 million for primary and secondary residences. You’ll receive a customized financing solution that meets your unique needs. Young Latino Artists 17 & Serie XIX photogr aph courtesy of giant noise. photogr aph courtesy of revi meicler. To have your gallery considered for listing in the Arts Guide, please send a request to events@tribeza.com. Pony hair on shoes and rabbit fur on vests is nothing out of the ordinary, but human hair strung around the neck? New York conceptual clothing designer Hayden Dunham crafts pieces that are more than simply pretty accessories: above all, this Austin native considers herself an artist who happens to create wearable work. From adolescent nostalgia to the simultaneous repulsion and familiarity evoked by hair, Dunham engages profound, universal sentiments in her pieces. Her New Dust line of plastic, leather, metal, wool and human hair necklaces has been picked up by several stores, including JF & Son. View Hayden Dunham’s work online at haydendunham.com. In an industry of fleeting trends, Jamie Pope, the designer behind Liz James, strives to deliver timeless pieces of jewelry. Named after Pope’s middle name and childhood nickname, the company opened two years ago when the designer retired from her career as a dental hygienist to make the leap into jewelry design. Originally a hobby, it has now flourished into a line of versatile creations crafted with quality materials. Pope hopes to continue expanding while keeping that one-of-a-kind vibe and a price point that won’t make your husband sweat. Shop the collection online at lizjames.com. clock wise from left: hayden dunham, photogr aphy by jimmy kim; neckl ace, photogr aphy courtesy of liz james; taylor mccausl and, photogr aphy by Solveig Sel j.
G one a r e the days when vintage shopping only meant scouring endless thrift store racks and digging deep through bargain bins and estate sales. Don’t get us wrong: those methods still exist (especially in a city as vintage-obsessed as Austin). Nowadays however, as the world connects, explores and — most importantly — shops online, a few Austin-based businesses are creating a new type of vintage-treasure-hunt experience. The women of GypsySun Vintage, Ax+Apple, Splendor and The Black Swan Theory are not only purveyors of eclectic clothing and accessories with unique histories, but also hybrid visual editors and storytellers in their own right, taking advantage of the digital medium and its creative possibilities. While go-to favorites like Etsy and eBay have their place in the conversation, finding and curating a collection of garments is only one piece of the vintage retail puzzle. Each of these stylish businesswomen is crafting the identity of her individual brand via well-designed websites, magazine-worthy photo shoots and social-network savvy, proving that it is possible to experience the thrill of the thrift with merely a click of the mouse. Finishing each other’s sentences and laughing together as if on cue are just two of the ways that Lindsay Lipscomb and Eryn Brooke act like siblings. Although not actually related, the two women grew up together and consider each other such close friends, confidantes and style soulmates that they’d rather refer to each other as sisters. As with most passion-driven creative businesses, GypsySun Vintage was born organically out of a service that Lipscomb and Brooke were already providing for friends. “We were dressing people and didn’t even realize it. It was then that we thought, ‘they’re coming to us for a reason, so we should just do it,’” Eryn Brooke recalls. “It” of course refers to capitalizing on their taste by making a business out of their shared love of vintage clothing. Although they did open and run a retail shop for a little over a year, the two ultimately discovered that their “gypsy” souls and creative wanderlust couldn’t be confined to a 9-5 space, so they moved operations online. arsenal receives that extra dose of modernized TLC, she does take care to curate a collection of garments that caters to an eclectic range of styles, albeit with a bohemian, ethnic vibe and an eye for “cocktail wear.” “I grew up in Hawaii and was raised in a Latin family, so I tend to like to dress up a little more,” she says with a laugh while acknowledging her love of Austin’s laidback vibe. As a former makeup artist and aesthetician, Jimenez is well versed in the importance of appearances and image. Now with more available bandwidth, she hopes to re-create the look and feel of her former boutique in its new digital home. “I can show my different ideas by constantly putting my vision out there with photo shoots, events, styling and websites like Tumblr — I now have more time to be creative,” she says. CELEbRATE THE LONg CENTER’S 4TH ANNIvERSARY wITH A TOTALLY AuSTIN EvENINg OF MuSIC, FOOD & FuN! Post-show Party on the City terraCe wITH AuSTIN bAND sauce! Young Bloods M eet th r ee yo u ng innovato r s challenging the conventions of fashion . F a s h i o n t h r i v e s o n d i v e r s i t y.
coffee-table skirt, “but I had just fallen in love with how functional and expressive fashion can be.” A strain of Chalayan’s avant-garde femininity colors the aesthetic of Jane, but the philosophy behind the collection is all Koiwai’s own. Raised in a half-Japanese, half-Caucasian household, Koiwai infuses his pieces with both Eastern and Western sensibilities. The first piece in Jane is a striking black dress that challenges the classic evening silhouette. With dramatic shoulders and a bold neckline raised to cover the mouth, the garment is armor-like, a strong and modern interpretation of womenswear. Koiwai further surprises the viewer with a vibrant panel onto which he has appliquéd his own hair in a pattern resembling koi fish. Upending conventions of beauty, Koiwai’s collection fearlessly engages questions of identity. “What defines a person?” Koiwai wonders aloud. “Is it their hair? Is it what they say? What they do? These are the questions that interest me.” Wherever his collection takes him, Koiwai is certain that he will continue exploring design after graduation. “As long as I am in the creative process,” he smiles, “I’ll be happy.” View Harrison Koiwai’s work at harrisonkoiwai.com. The Creative Director For creative director Ian Milan, fashion has always meant diving in headfirst. After a search for internships in 2010, he decided to take matters into his own hands and founded UT’s Student Fashion Cooperative with former TRIBEZA intern Autumn Ashley. In the spring of that year, the SFC had released its first issue of Spark (thesparkmagazine.com), an online fashion publication that showcases local talent while maintaining a global outlook. As editor-in-chief, Milan established Spark to offer direct, hands-on experience in fashion. “It’s an amazing opportunity for fashion students to figure out who they are and what they like,” he observes. Spark releases just two issues per semester, but each one is carefully crafted, featuring full editorial spreads styled by Milan and his team. Unafraid to challenge himself, Milan develops bold, fearless concepts, whether a highfashion approach to Disney villains or a tribal shoot at the Cathedral of Junk. “My eyes are always open to the world,” he notes. Though Spark often draws from the global fashion industry, it remains, at its core, a magazine by Austinites. “I have always said Spark could not have happened anywhere else,” Milan remarks, “Austin is so supportive of young and new creative talent. On a personal level, my biggest thanks goes to Sarah Ellison Lewis of Bootleg. She has become my greatest mentor and somewhat of a fashion mother to me.” Through Spark, Milan has collaborated with boutiques, hair stylists and makeup artists across the city, including Ricky Hodge Salon and Propaganda Hair Group. In the fall, Milan will be leaving Spark to pursue his studies in fashion design at Parsons The New School for Design. “Designing a collection or producing a shoot is a lot like running a ship,” says Milan. “You know where you want to go, there’s no set way to get there and there will likely be storms. One thing design, styling and leading Spark has taught me is to fight with all you’ve got.” View Ian Milan’s work at ianmilan.com. who knows how to shop. Tracey Overbe ck Ste ad, Owner of Tracey Overbeck Stead Interior D e s i g n & Ethan Ste ad, C o - f o u n d e r H i pp o s 3 & M a n a g e r , I n t e l A u s t i n A c c l a i m e d i n t e r i o r d e s i g n e r Tracey Overbeck Stead first spotted her now husband Ethan Stead at a party of Tracey’s best friend Dave Van Heuven. “I was mesmerized by his head-to-toe Prada ensemble. Back in 2000, that was a rarity in this town,” she says. It was soon into their whirlwind romance that Tracey realized she had a serious fashionist-o on her hands. “When we went on our first date back in 2000, he was sporting a Murakami T-shirt by Wild & Lethal Trash and a pair of Evisu jeans — both of which, pre-internet, pre-eBay, could only be sourced in Japan.” Ethan’s love affair with fashion all began when he bought a Vuarnet t-shirt on a seventh grade class trip to Quebec. He says: “My tastes have hopefully become somewhat more refined since then.” He continues to find style inspiration from the “clothes and cars of classic Bond films” and lives by the one simple style guideline — “Fit is most important. I am drawn to pieces that develop character as you wear them; however, some days, it’s all about the pop!” The couple loves to shop together (“we believe each other’s eyes are the most honest mirror,” Tracey says.) and can always pick the perfect pieces for one another, like a whalebone stud set that was custom scrimshawed to depict the lighthouse on Martha’s Vineyard where the couple was married or the Jaeger-LeCoultre Reverso Gran’Sport Chronograph watch that Tracey gave her groom on their wedding day. “We are drawn to the same things, but I tend to focus more on the technical details and construction of clothes while Tracey loves the overall visual impact.” Together, it’s a perfect match. but I can’t fit in to hers.” Of all his ensembles, Sara most prefers Kale in his pair of red jeans or thyme green Volcom chinos. “I just love that he isn’t afraid of color,” she says. Although she hopes he doesn’t take it too far with the bright yellow Volcom tracksuit for which Kale often expresses his desire to purchase. He often helps Sara choose outfits when she gets overwhelmed, and since dating Kale, she’s grown her own personal collection of Vans. “As far as our overall styles, we went hand in hand from the beginning, but he has instilled in me a new confidence in just being yourself,” she says. And there is no better look than that. Jeans by Adriano Goldshmied $172, Shirt by Mason $125, Belt by Riggs & Bankcroft $55, all available at Neiman Marcus. Skirt by Alice & Olivia $396, Tank by Alice & Olivia $165, Shoes by Jimmy Choo $720, all available at Saks Fifth Avenue; Gold necklace $25, Beehive; Gold and Green Necklace $38, Madewell; Belt $36.50, J. Crew. Facing Page On Lexi: Sweater $65, Blouse $110, Jeans $78, Madewell; Belt $36.50, J. Crew; Necklace $22, Beehive. On Astin: Shirt by Mason $125, Jeans by Citizens $180, Neiman Marcus. Right Dress by BCBG $345, Saks Fifth Avenue; Necklace $28, Beehive; Bag by Givenchy $1,280, By George; Shoes by Prada $720, Saks Fifth Avenue. Dress by David Meister $310, Blazer by Rachel Zoe $425, Necklace by Herve Van Der Straeten, $2,155, Wedges by Tory Burch $195, all available at Neiman Marcus. Sweater $62.50, J. Crew; Shirt by Penguin $65, Chinos by Ben Sherman $129, Shoes by Cole Haan $155, Service Menswear. On Astin: Shirt by Naked & Famous $145, Tie by Gitman Bros. $88, Watch by Nixon $75, Service Menswear; Shorts $59.50, J. Crew. On Lexi: Skirt $110, Belt $36.50, J. Crew; Blouse $98, Madewell; Bangles by Megan Park $70 each, By George. On Astin: Blazer by Plectrum by Ben Sherman $260, Shoes by Vans $75, Jeans by Naked & Famous $140, Service Menswear; Shirt by Vince $68, Saks Fifth Avenue. On Lexi: Pants by Alice & Olivia $198 , Blouse by Alice & Olivia $158, Neiman Marcus. Jeans by Naked & Famous $140, Shirt by RVCA $55, Sunglasses by Moscot $225, Service Menswear; Sweater by Hugo Boss $101.50, Saks Fifth Avenue. About the Location Perched on the edge of a limestone bluff, this threestory retreat was designed by renowned architect Richard Gluckman, along with project architect Elizabeth Rexrode, and built by Joe Pinelli. The house provides a sense of solitude and seclusion. The west entry facade uses louvers and freestanding walls for privacy and sun protection. Garden walls and a long rectangular reflecting pond define the formal entry. The east facade maximizes close views of Lake Austin and distant views of the city center. Texas Leuders limestone, characterized by its materiality and texture, along with stucco and cedar siding, is used for the interior and exterior walls. The interior assigns public and private areas to opposite sides of the entry hall. The master bedroom suite forms a private upper level. Interior living areas flow seamlessly into and out of the garden through large glass doors and windows. Inside, the material palette consists of limestone, natural wood (oak, mahogany, wenge), blackened steel, glass and concrete. Blackened steel gives visual weight to the sculptured stair, while translucent and back-painted glass provide a feeling of lightness at the lower-level stair and master bedroom. For more info, visit 505lakecliff.com. photographs courtesy of gottesman residential real estate. Jennifer is wearing a Esley dress $65 from Beehive. Jennifer is wearing a Alchemy “Horus Falcon” linen tank $48, Court Denim high waisted bells $137, 90s platform shoes $42 and a Via Christa necklace $140. All from Feathers. Masha is wearing a blouse $58 and vintage Ungaros skirt $62. All from Feathers. Masha is wearing a Aryn K jacket $115, C. Luce shorts $65, Mono B shirt $38 and a necklace $30. All from Beehive. Scott is wearing a t-shirt by Save Khaki, jeans by Levi Vintage Collection, shoes by Alden and glasses by SALT (all available at By George) with a jacket by Penfield from STAG. Isaac in his own clothes. Scott is wearing a suit from Estilo, t-shirt from Factory People, boots by Helm Handmade and necklace by Kelly Young for Deconstructed Design. Scott is wearing a D&G shirt from Buffalo Exchange, jackets from Top Man NY and Lonsdale London, Mark Nason boots from Nordstrom and necklace by Kelly Young for Deconstructed Design. Isaac is wearing a shirt by Steven Alan, pants by Dries Van Noten, jacket by Comme des Garรงons, cardigan by All Saints, shoes by N.D.C. Handmade and glasses by SALT. All from By George. Isaac is wearing a t-shirt by Gitman Vintage, jeans by Raleigh denim, sweatshirt by Alternative Apparel, denim jacket by Levi Vintage and glasses by SALT. All from By George. «« E nte r the T r a v i s H e i ghts wonde r l a nd of a r t i st E l i z a b et h C h ap i n .
Chapin claims her vivid kitchen is the “most practical room in the house,” a necessity since she shares a passion for cooking with her husband and children. “It’s like a conversation I’m having with them,” Chapin says of her portraiture. She took up painting at five, but began taking it more seriously after studying art in Paris. Chapin likes taking things she’s inherited, “that are beautiful in their tradition, but turning them on their heads and making them ironic.” She makes inherited pieces less fussy by mixing them with playful art. Chapin is happy to have a home where she can spread her toes in green grass, much like she could growing up in Jackson, Mississippi. She loves that Austin’s relaxed spirit allows for anonymity if one wants it, whereas in Mississippi everyone had been concerned with getting her “borned, married, and dead.” Though she’s left the aesthetically rigorous New York, she believes Austin has similar energy, along with a laxity that results in rawness. There is much energy in Chapin’s own work, in the lines and colors she uses to capture her subjects, turning the shadows and contours of their faces into patterns that almost hum. As a guest in her colorful home, one feels they may just sink into the patterns on her sofa and become a character in one of her paintings. Chapin enjoys telling the individual stories of her family members through portraits. She giggles at the fact that her mother hovers above the bed she shares with her husband Nathanial (left). “She used to sit with a can of sardines and wait for me to come home at night.” Chapin’s fun-loving spirit is just as apparent in the rooms of her children Alabel (above) and Henry (right). Uchi's Tuna and Goat Cheese. Photography by Rebecca Fondren. Our resident foodie Lisa Siva gives the dish on the events you don’t want to miss. Morimoto will be sharing his expertise during a demonstration of traditional sushi techniques. Whether it’s tackling a whole fish or skillfully composing a sushi roll, “Mastering the Art of Sushi” promises to be an exciting start to the festival. chef masuharu morimoto, Andrew zimmern and r ay isle, photogr aphs courtesy of austin food & wine festival. 2-3:45pm James Beard Foundation Award winner Chef Tyson Cole of Uchi and Uchiko will be offering a hands-on demonstration, sharing his innovative culinary techniques. “It’s no different than what we try to do with the food at Uchi and Uchiko,” he notes. “I want to showcase the creativity and the things you can do with sushi.” Guests will prepare fish and roll sushi alongside Chef Cole, who will offer guidance on masterfully composing and presenting plates. How to Open a Boutique etceter a , etc. owner emma kate gives us an inside look into opening a store in the 2nd street district. Etcetera, Etc. is a perfect spot to shop for any occasion. They offer an array of party dresses, as well as colorful work attire. From confetti to candy to tea cups, no detail is left unnoticed in this playful boutique. For more information, visit the Etcetera, Etc. Facebook page and Emma Kate's blog, theworldofetc.com. i l l ust r at i on by joy g a l l aghe r For a limite d- e dit i on p r int , c onta c t jo ygall agh e r@g m ail .c om . LIVE YOUR ADVENTURE. WHITTNEY CLINKCSCALES : OCCUPATION : Was a Nurse, now a RevEx Coach TRAINS WITH : Coach Nicole SECRET DREAM : To do a bikini competition, become a Fitness Model and RevEx Coach IN MY 12 WEEKS : I placed in a bikini competition, became a fitness model AND a RevEx coach! I had tried a million things before RevEx, and nothing worked. I was ashamed to admit my dream to anyone, but Mariah and her team at RevEx not only made me comfortable with my dream, they pushed me to achieve it. Now I want to help you. Any age, any shape or size, you will achieve your dream. Went from 25% to 9% bodyfat in 12 weeks of RevEx Training. .
ERIC ZIEGLER OCCUPATION : RVX client turned RVX Coach TRAINS WITH : Coach Mariah SECRET DREAM : Climb Mount Everest in 2 years. Qualify for the CrossFit Games in 2013. Run 7 Marathons on 7 Continents. IN MY 12 WEEKS : I gained 10 lbs of muscle. Now I’d like to help others achieve the same results I did. Any shape, any size, any age, any dream: I can help you get there. Gained 10 lbs of muscle in 12 weeks of RevEx Training. fl atstack pl atforms $178, Madewell; Available at Madewell, 11501 Century Oaks Terrace. m aya neckl aces $265 GROWING; Available at Kick Pleat, 918 W. 12th St.
zigz ag ring $1200 Lauren Elizabeth Craft; Available at Eliza Page, 229 W. 2nd St.
Must-reads for pattern inspiration sa m neckl ace $195 Kendra Scott; Available at Kendra Scott, 1400 S. Congress Ave., A-170, and kendrascott.com. the perfectly imperfect home $30, by Deborah Needleman; maps $50, by Paula Scher; Available at Barnes and Noble locations, and bn.com. Sometimes you need a time-out too. OPE RA Will love melt the ice princess? Devon dyer , 22, Dallas, TX, "This outfit is one of the edgiest things I've worn, and I was actually scared to wear it." Merritt Beck , 24, Austin, TX, wearing her grandmother's coat from the 50s. 25, Grand Rapids, MI. "I love sleeved dresses." 26, Austin, TX. "I styled my best friend." Houston, TX. "I'm wearing two dresses." fashionable bloggers and shop owners discussed "thinking beyond" websites and storefronts at this stylish gathering. 25, Austin, TX, wearing a classic trench. Amber Venz , 24, Dallas, TX, wearing Zara leather pants, a vintage fur coat, a Fendi Belt from Neiman Marcus Last Call. She recently became a redhead. J.D. medrano, 30, Coleen, TX, wearing a Marc Jacobs shirt and jewelry by his company, 2 Months Rent. Andrea kerbuski , 26, Lansing, MI. Blondebedhead.com is her blog. "I'm wearing fave glasses from Bonlook." IMAGES images COURTESY courtesy OF of BOBBY bobbyJOHNS; johns;(3, (3,6) 6) PHOTOGRAPHY photogr aphyBY byALLISON allisonV.v.SMITH; smith;(9) (9)PHOTOGRAPHY photogr aphyBY byALEXANDRA alex andr a VALENTI; valenti;(10) (10)PHOTOGRAPHY photogr aphy BYby ANNIE annie RAY. r ay. hbdhiWZadkZYhinaZ^Xdch$ shops Mercury Design and STAG â&#x20AC;&#x201D; heâ&#x20AC;&#x2122;s one of Austin's most beloved style icons. 1. When taking fashion risks you sometimes make fantastic mistakes...I also wore these Pucci-esque pants to my high school graduation, to my parents' horror. Hotel Ha- for horror. 2. 2. "Working" STAG is a at labor of love vana, 2009 3.allSteve I inlead our me teepee, 4.ofThe I moved to and NYC...I stayed at the Chelsea Hotel wentto toNYC...I the top stayed of the Met. neverHotel beenand to NYC 5. more San thanAntonio, one person and roadsand have to be2008 a part thisday team 3. Steve I in our teepee, 2008 4. The day and I moved at theI had Chelsea went before to the top Photobooth Steve been 6. Portrait by Allison V. Smith 7. My with ďŹ rst suit â&#x20AC;&#x201D; 6. circa 1976. Iby remember wear this suit the1976. time.IWhat you can't see are the starburst studs theWhat front of the Met. I with had never to NYC before 5. Photobooth Steve Portrait Allison V.wanting Smith 7.toMy first suit â&#x20AC;&#x201D;all circa remember wanting to wear this suit all the on time. and can't back. see 8. My â&#x20AC;&#x201D; Bobbystuds JohnsonSr.the Hefront has always been style icon â&#x20AC;&#x201D;Johns this photo was a head to my be an "Best Little Whore Texas"...he overlooked sadly. 9. you are dad the starburst and back. 8. my My#1 dad â&#x20AC;&#x201D; Bobby Sr. He has alwaysshot been #1 extra style in icon â&#x20AC;&#x201D; this photo wasHouse a headinshot to be anwas extra in "Best Little Family forTexas"...he TRIBEZAwas by Alexandra I feel lucky to be GM of by theAlexandra Hotel SanValenti Jose â&#x20AC;&#x201D;10. andI feel luckylucky thatto LizbeLambert a boss and friend. 11. Steve I being married in SF Whoreportrait House in overlookedValenti sadly. 10. 9. Family portrait for the TRIBEZA the GMisof the Hotel San Jose â&#x20AC;&#x201D; andand lucky that Liz Lambert is in 2004and when for a11. brief moment it was legal. I am towhen be a part thismoment history and more proud married to aSteve! a boss friend. Steve and I being married in so SFproud in 2004 for aofbrief it was legal. I amtosobeproud to be part of this history and more proud to be married to Steve! gress, maya krauss expands her vision of modern, urban style. photogr aphy courtesy of co-star. enoir is like going to a cool friend’s dinner party. Housed in a funky bungalow, its cozy dining room holds just 32 people, who happily squeeze in wherever there’s room — atop barstools, at bistro high-tops or along the communal table. Its Bohemian-chic décor reflects the yin-yang of its married owners, playfully mixing masculine and feminine, modern and vintage. The intimate space is charged with a palpable energy from Austin’s eclectic cross-section of the culinarily curious. The Wheels are in Motion! Studio 54 meets the ultimate disco roller rink in XANADU at ZACH’s 2012 Red Hot & Soul Gala! Saturday, April 21 • 6:30 p.m. • Hilton Hotel, Austin Gala Co-chairs: Bobbi Topfer and Larry Connelly The party erupts with ZACH divas belting out 80’s hits, spectacular exhibition roller skating and an exclusive sneak peek at ZACH’s musical XANADU starring the heavenly Jill Blackwood! Enjoy cocktails and a seated dinner, silent and live auctions and get down and boogie with DJ Manny. Xanaduish attire welcome! Get in motion! Buy tickets now at zachtheatre.org. Contact: Eric Scott at 512- 476-0594 x260 or escott@zachtheatre.org. 200 Congress Ave. (512) 827 2760 Helmed by noted Chef David Bull, Congress is an elegant foray into complex layers of exquisite flavors from around the world. Congress features dishes with depth, including sweet and savory bone marrow brulee and hamachi sashimi with hearts of palm and white miso. Enjoy the wine list carefully crafted by Beverage Director June Rodil, named Best New Sommelier by Wine & Sprits Magazine. Chefs Paul Qui, Moto Utsonomaya, and Ek Timrek of Uchi comprise the impressive trio behind East Side King, a panAsian, fusion trailer. The menu is eclectic, featuring a variety of filling dishes from sumptuous pork belly buns to Thai Chicken Karaage. 400-A W. 2nd St. (512) 499 0300 Chef René Ortiz offers a menu inspired by the hip and bohemian Condesa neighborhood in Mexico City, accompanied by delicious cocktails by mixologist Nate Wales. Be sure to end on a sweet note with the Hoja Santa semifreddo by Laura Sawicki, named FOOD & WINE’s Best New Pastry Chef. Crowned Best BBQ Restaurant in America by Bon Appétit, Aaron Franklin’s eponymous eatery is a true Austin institution. A former food trailer, Franklin’s new brick-and-mortar location now sells out of its 700 pounds of meat by 1:30 pm each day. Be sure to try the sumptuous Meyer allnatural angus brisket. Enjoy classic fried chicken with some surprising twists by Chef James Holmes. From fried chicken gizzards to buckets of the traditional American staple, Lucy’s is sure to satisfy your crispy cravings. Start with a selection of aromatic, wood fire grilled oysters. 801 S. Lamar Blvd. (512) 916 4808 With renowned chef Tyson Cole at the helm, Uchi has become synonymous with excellence in modern Japanese fare. Start off with a series of hot and cold tastings before diving into the restaurant’s innovative sushi menu. 4200 N. Lamar Blvd. Ste. #140 (512) 916 4808 Under the reign of Chef Paul Qui, Uchiko is the sensational sister creation of Chef Tyson Cole’s Uchi. From hot and cold appetizers to sinfully delicious entrees like rabbit terrine to mastermind desserts crafted by Chef Phillip Speer, dining at Uchiko is an out-of-this-world culinary experience. Austin Organic Tan is located at Lather Salon and delivers gorgeous, natural and long-lasting tans! tanning products contain antiaging ingredients such as Vitamin C, Cranberry Seed Extract, Walnut Shell Extract, Sea Kelp and more. oasting an intercontinental selection of British, Greek, Mexican and Asian cuisine, the trailers at East Side Drive-In are a great way to voyage afar without leaving your seat. But my favorite destination of the lot is Love Balls, the orange retro-fitted short bus serving up bona fide Japanese street fare. The menu ranges from traditional Japanese miso soup to rice balls wrapped in seaweed, but the namesake dish is the popular street treat, Takoyaki, a fritter stuffed with octopus pieces, scallions and pickled ginger, glazed in a kewpie mayo and garnished with aonori and bonito flakes. The Takoyaki’s vegetarian-friendly counterpart is The Veg, a similar, deep-fried batter ball, but with mushroom rather than octopus. The Side Set, a Vegan option, offers garlic yaki-onigiri, miso soup and veg stix. Shown: The Canaletto closet system.